for a brief visit on this special day. 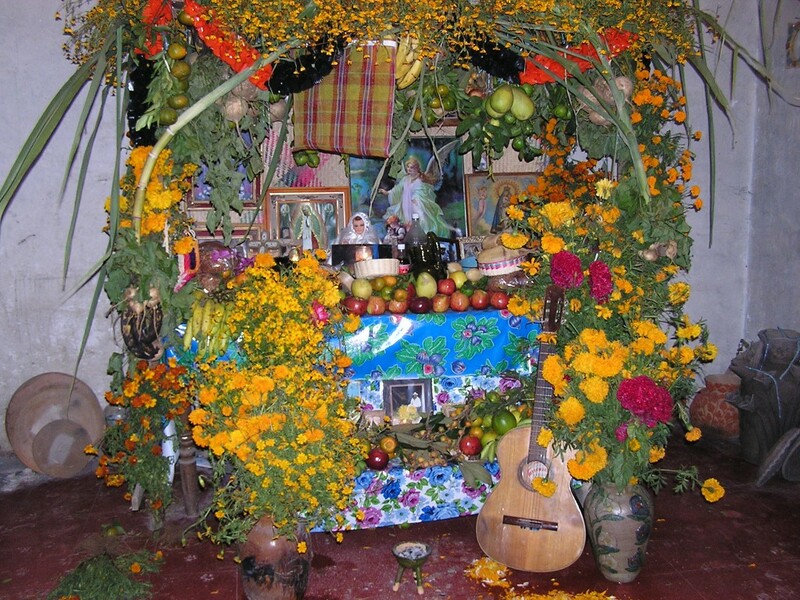 Families spend as much as they can afford to adorn their altars with fruit, figurines, flowers, candles, papel picado, decorations, and copal to honor their loved ones as they share this precious time with them once a year. I know people who think Day of the Dead is creepy; I see it as one of the most beautiful and delightful celebrations ever. 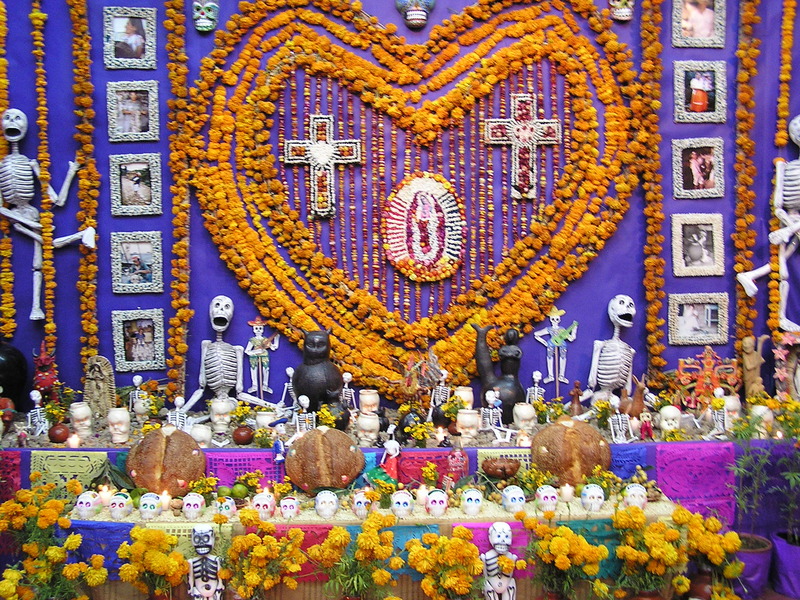 To share more Dia de los Muertos traditions, visit Rebecca each Sunday in October @ http://corazon.typepad.com/. 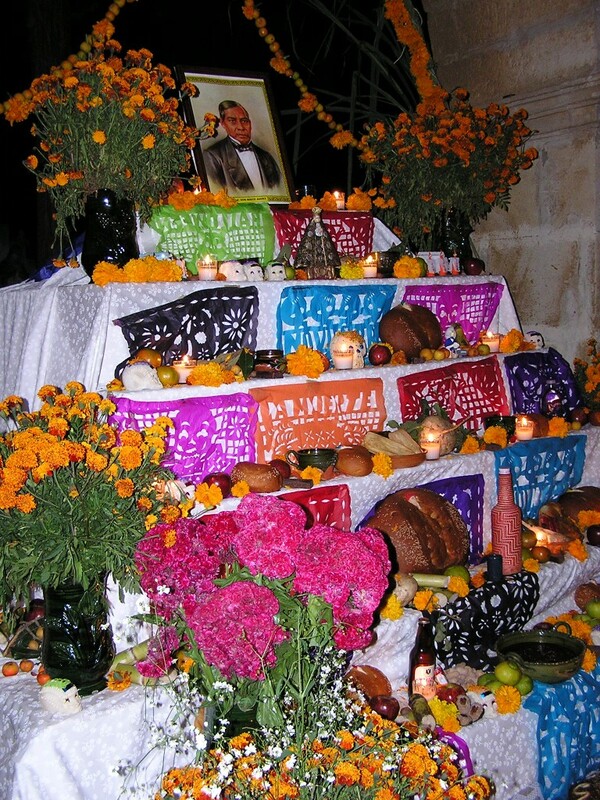 ~ by Dawn Elliott on October 1, 2011.
thank you dawn for your heart stopping collection of dia de los muertos altars from oaxaca and san miguel de allende. thank you too for joining me for all our sojourns to mexico to take part in the celebrations that are so difficult to fully convey, but truly will live on in our hearts forever. i am thinking of the long nights in the panteon together…and grateful for each one. I think they are colorful and intriquing!! I may put up a small one myself this year. Absolutely beautiful. I am leaving up my altar this year so to celebrate every day with those that I love now gone. Loved your post. These are beautiful shrines Dawn. This is my first year participating in dia de los muertos. I am so ready to celebrate both of my parents. 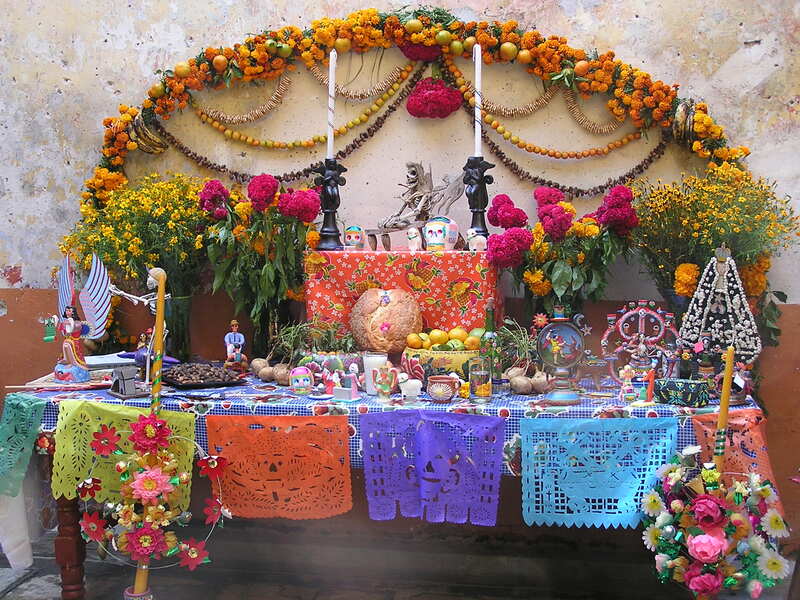 These altars are beautiful with the garlands of marigolds and the bright papel picado. I wish I could have gone on this trip with you to see these altars in person. Thank you for sharing these photographs and the meaning behind them. Always so beautiful. Each year I say that I am going to do that, but each year, I don’t. I guess it’s because I don’t want to be the only one in my household ‘into it’. These are stunning altars and stunning photos. Thanks for posting, Dawn! What amazing shrines. I love this holiday and what it represents. Thank you for sharing this! Yes, yes, yes. I am so glad you explain this so well for visitors who may not have the same attraction to this celebration as those of us who are preparing for it this month. Thanks. I love the colours of the flowers and the ritual of the altar setup. I’d like to see this in person. I posted my Los Dias article from the road and didn’t get much time for visiting others until this morning. These altars are beautiful, as they all are. Each with a personal touch, some things mean only something to the maker, others mean everything to all. Great photos.